Following the July 4th holiday, the US government is reacting on all levels to North Korea’s successful long-range ballistic missile test. This has included ‘kinetic’ acts such as the laughably knee-jerk launching of US and South Korean short-range ballistic missiles, as well as officials giving a number of statements and answering questions on the matter. At the same time, North Korea has released footage of the test, including on-board video that hints at just how developed this new missile system is. We have already reported that the HS-14 is a liquid-fueled missile, but that’s not what’s important here. The fact that the US had eyes on the launch site is an interesting revelation, although it may not be as surprising as it sounds. The War Zone has discussed all the various US aerial surveillance assets that are put to work over the Korean Peninsula on any given day. But which asset would have been able to garner this level of detail in short order can be narrowed down to a likely few. The U-2 Dragon Lady or the RQ-4 Global Hawk may have been able to use their long-range electro-optical/multi-spectral sensor suites to peer roughly 50 miles, deep into North Korea, at the never before used launch site located just south of Kunsong, near the Panghyon aircraft plant. Synthetic aperture radar that flies aboard both aircraft could also have been used to capture snap shots of the scene, and maybe fueling trucks would have been able to have been identified under certain conditions. The U-2 has long operated out of Osan Air Base in South Korea and the RQ-4 flies out of Yokota Air Base in Japan. On the other hand, if the site was actively being watched in a much more intimate manner, one aircraft in particular could have provided streaming video of the scene without being detected by North Korean radars—that aircraft being the RQ-170 Sentinel. This type of mission is precisely what RQ-170 was built to accomplish—to penetrate into hostile airspace day or night, and persist overhead key locations, spying on life below and recording patterns of movements and fine details—like being able to distinguish a fuel truck from any other type of vehicle—from on high. The RQ-170 has supposedly been active over the Korean Peninsula and in the Pacific Theatre for years now, and closely monitoring North Korea's high-profile and high-stakes missile launches would be well worth the risk of flying such a mission. With this in mind, Kim himself could have been in the Sentinel’s optical crosshairs while watching his latest rocket fantasy turn into reality. It is possible that satellites could have provided this information, but they are not well suited to do so as they only capture a “snapshot” in time, and fly along predictable routes. Another aircraft, one that is officially undisclosed, such as the high-flying and stealthy ‘RQ-180’, a multi-role strategic platform, may have been able to accomplish such a feat as well, but from what we know historically, the Sentinel would probably be a better choice for the mission. Deploying an aircraft like the RQ-170 to closely monitor a launch site preparing for an immanent new missile test would also allow for the US to coordinate the deployment of strategic surveillance assets. This way they can be looking at the right place at the right time in a combined effort to gain intelligence from the launch. This includes a huge array of sensors, from satellites to missile defense radars, and especially USAF RC-135S Cobra Ball missile tracking aircraft that are forward deployed to Japan. Regardless of the asset that was surveying the site as the launch process unfolded, the fact that the missile was found well before its launch, and at an entirely new and seemingly austere launch location, is an indication of just how well surveilled North Korea is at any given time by the US and its allies. It also underlines the inherent vulnerability of liquid fueled missiles to preemptive attack. 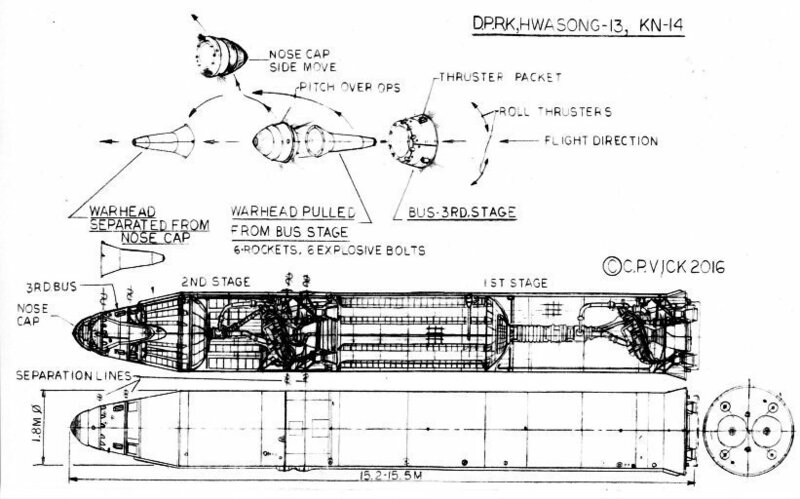 In this case, the HS-14 could have beed blown up while still on its platform. While the US was spying on the Kim regime's long-range ballistic missile launch, the North Koreans themselves were conducting some fairly high-fidelity surveillance of their prized missile. The country just posted video of the launch, and it includes on-board camera angles that show a fairly mature system in flight. The video shows not just the first stage cleanly separating from the second stage, but also the missile's nose cone being ejected as pointed out by defense analyst Joseph Dempsey. Once drag and air friction is no longer an issue, the separation of the nose cone—also referred to commonly as the nose cap—exposes the warhead reentry vehicle and will allow it to travel on its way back down to earth when it is separated from the final stage. You can see some rough renderings of what such a system looks like here and here. The fact that we see this occur in the video is an indication of the advanced state of missile design as a nuclear warhead delivery system. The fact that on-board video was relayed from the missile to the North Koreans on the ground, likely along with telemetry, is also interesting. It would seem that jamming these signals would be a prudent non-kinetic, anti-proliferation tactic by the US and its allies. Then again, just how prone the line-of-sight transmissions North Korea uses for these purposes are to standoff jamming and electronic attacks is another question entirely. “The United States strongly condemns North Korea's launch of an intercontinental ballistic missile. Testing an ICBM represents a new escalation of the threat to the United States, our allies and partners, the region, and the world. Global action is required to stop a global threat. Any country that hosts North Korean guest workers, provides any economic or military benefits, or fails to fully implement UN Security Council resolutions is aiding and abetting a dangerous regime. All nations should publicly demonstrate to North Korea that there are consequences to their pursuit of nuclear weapons. We intend to bring North Korea's provocative action before the UN Security Council and enact stronger measures to hold the DPRK accountable. The United States seeks only the peaceful denuclearization of the Korean Peninsula and the end of threatening actions by North Korea. As we, along with others, have made clear, we will never accept a nuclear-armed North Korea. So officially it would seem that the age of North Korea possessing a long-range nuclear weapons delivery system has arrived. After more than a decade of nuclear and missile tests, the Pentagon has only stepped up its surveillance of the isolated country. The KN-06 may not be state-of-the-art, but it represents a credible and potentially wily threat for US and South Korean combat aircraft. As war drums grow louder, the US and its allies are encircling North Korea with military might. Meanwhile, the White House is about to brief the US Senate as to its plans.